"A memorial stone commemorating the Roman links with Lanchester. Longovicium was an auxiliary fort located on Dere Street, a major Roman road running from York to Hadrian'sWall and beyond. 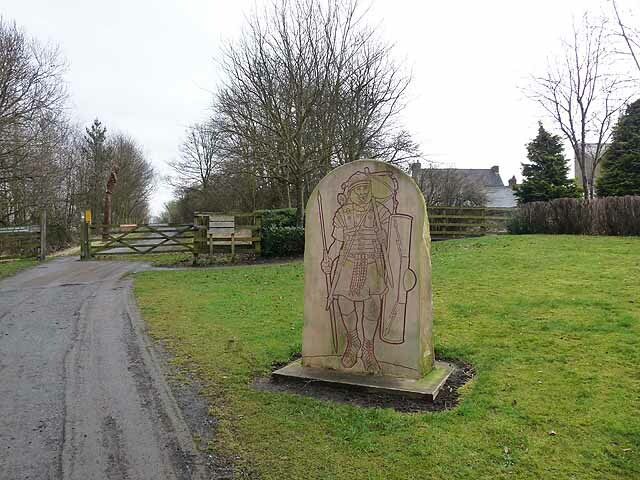 The stone stands beside the Lanchester Valley Railway Path (National Cycle Network, route 14) one of many railway paths in County Durham, which follows the line of an old railway from Consett to Durham. The railway was opened in 1862, closed to passengers in 1939 and finally closed in 1965." Photo by Oliver Dixon, 2013, and licensed for reuse under a Creative Commons Licence.